This week we've seen something that usually only happens during royal tours: seven full days of appearances by the Duchess of Cambridge! 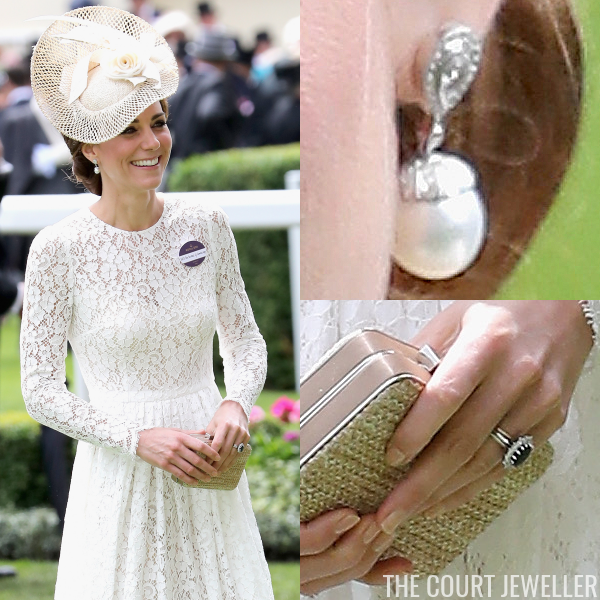 Here's a recap of the jewels she wore, including several new pieces. Be sure to vote for your favorites in the poll below! Kate hosted an anniversary dinner at Kensington Palace for SportsAid; the event also included a pre-dinner reception for a number of British athletes who will compete in this summer's Olympic Games in Brazil. 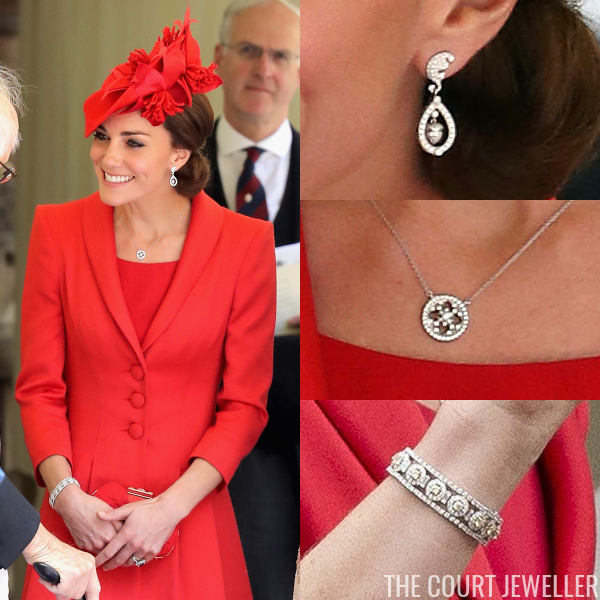 With her Roland Mouret gown, Kate wore a new pair of diamond-encrusted gold hoop earrings by Cartier, plus her engagement, wedding, and eternity rings. The entire Windsor family gathered at St. Paul's Cathedral in London for a service of thanksgiving in honor of the Queen's 90th birthday (and Prince Philip's 95th birthday). 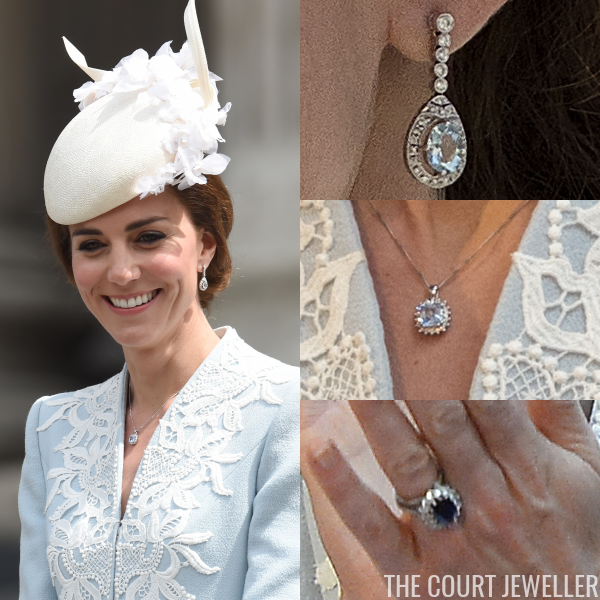 Kate wore a Catherine Walker coat dress with her diamond and aquamarine drop earrings, a new silver-toned necklace with a square, light-blue gemstone cluster pendant, and her engagement, wedding, and eternity rings. The Queen's official birthday celebrations continued on Saturday with Trooping the Colour. Kate rode in the carriage procession and then appeared on the Buckingham Palace balcony with William, George, and Charlotte. With her Alexander McQueen coat dress, she wore new earrings, the "Eugenia" style by Balenciaga (set with faux pearls and crystals), with her Mappin and Webb Empress Mini Pendant Necklace and her usual trio of rings. The royals gathered at Buckingham Palace again for the Patrons' Lunch on the Mall; Kate went on a walkabout with William and Harry and sat with the rest of the family to watch a special procession. She wore a Roksanda Ilincic dress with her Mappin and Webb Empress Mini Pendant Necklace, the matching Mappin and Webb Empress Drop Earrings, and her usual rings. The knights and ladies of the Order of the Garter gathered for the annual luncheon and service at Windsor Castle. Kate wore a Catherine Walker coat dress, pairing it with her diamond Robinson Pelham wedding earrings (for the first time in public since the wedding! 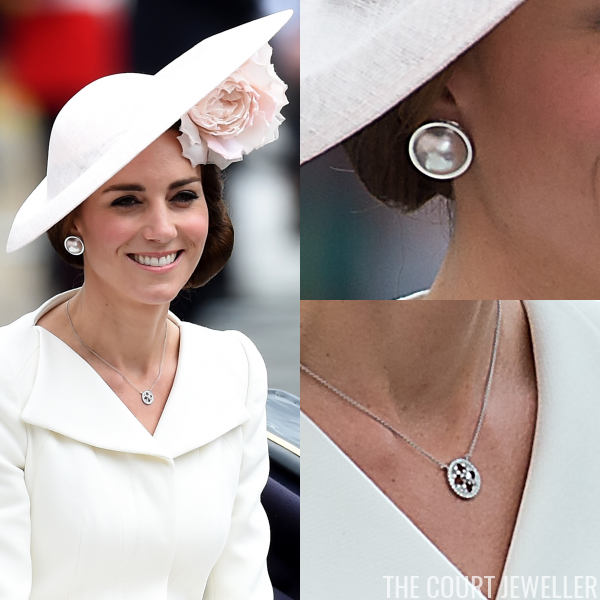 ), the Mappin and Webb Empress Mini Pendant, the diamond cluster and baguette bracelet, and her usual trio of rings. On Tuesday morning, William and Kate visited the American Embassy in London to sign a book of condolence following the Pulse nightclub massacre in Orlando. 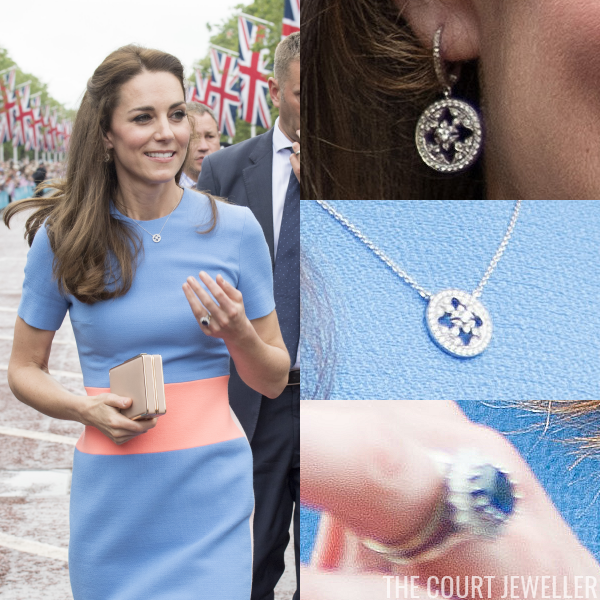 Kate's attire and jewelry for the occasion were subdued. 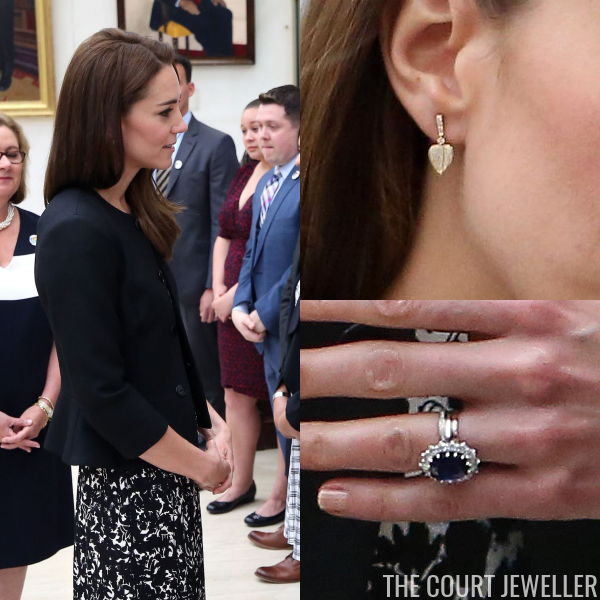 She wore a Tory Burch dress and a Ralph Lauren jacket with her Kiki McDonough Lauren earrings (a pair in the shape of a heart, echoing the rainbow heart that has become a widely-shared symbol of support following the shooting) and her engagement, wedding, and eternity rings. William and Kate traveled to Northern Ireland on Tuesday afternoon to attend a garden party at Hillsborough Castle. 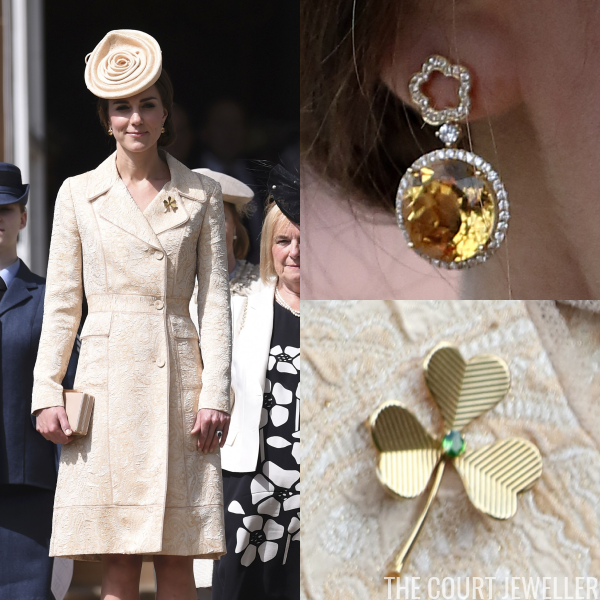 Kate wore a Day Birger coat dress with a new pair of Kiki McDonough earrings (the Eden Diamond Flower Earrings with citrine drops), the Irish Guards Shamrock Brooch, and her usual trio of rings. Kate made her very first appearance at Royal Ascot on Wednesday, when William presented a trophy for the Duke of Cambridge Stakes. Kate wore a white lace Dolce and Gabbana dress with new pearl drop earrings (maker still unidentified) and her engagement, wedding, and eternity rings. 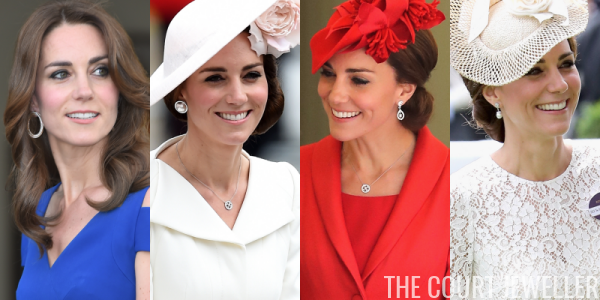 Which of Kate's jewels are your favorites?